The route starts from the ski station at the Col de Marcieu (1055 m, grid ref. UTM 31T 72862 50265) where there is ample parking. Make your way up the road labelled the Chemin de l'Aup du Seuil, opposite the car park. At the first bend, the tarmac gives out and it becomes a well-graded forest track. Fifty metres past the next bend, a sign-posted path goes off to the right. Follow this through a couple of pistes to where it divides. Take the upper path on the left which is a little muddy at first. A sign-posted junction soon follows, and we turn left. Some 30 minutes after leaving the car, following a steeply ascending stony section, a forest track crosses the path. Straight on leads up to the Passage de l'Aup du Seuil, but we turn right on our way to Pas de Ragris. After 50 metres another track is met - keep right down the hill. Shortly after, you will encounter a set of uncompromising metal barriers marked "Zone interdite". Slip through these, and continue across the next junction of tracks. You are now on a gently ascending track, which doubles back on itself and eventually reaches an abrupt end at a boulder near the 1483 m point on the IGN map. It has taken under 1½ hours to reach this point from the car. From here, our path is not on the map, but it is clear underfoot, and starts behind the boulder. It climbs steeply through the woods, to meet a path coming up from the right after ten minutes. Keep left, and follow it to under the cliffs where another path is met. Turn left again, and continue across a platform where climbing bolts adorn the cliff walls above. The path then starts to ascend into the cirque through avalanche damaged pines. Half way up is an easy rocky barrier, and soon after the path traverses round to the left into a gully. The way at the top is blocked, but a cable-assisted traverse round a ledge enters another gully where easy scrambling leads onto the summit ridge, after some 2½ hours of ascent. The 1926 m high point is reached after twenty minutes of easy walking along a fine path which follows the ridge. 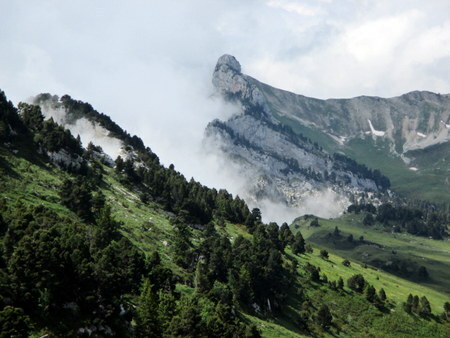 It is crowned by a mountain rescue radio relay station, and has fine views across the Vallon de Marcieu to the opposite ridge, and down the valley to Mont Outherand. On a clear day the Alps beckon to the east. Returning back along the ridge, five minutes past the gully we ascended, there is a cross marking the top of the Passage de l'Aup du Seuil, which is our way down. After a short descent, it traverses into the next cirque, which it descends in sweeping zig zags below impressive cliffs. Some serious engineering has been put into this path, not least in the barriers placed to keep animals safe from the drops. Once down the main part of the cirque, the path turns into a steeply descending track and enters a small alp, some 40 minutes after leaving the ridge, where there is a choice of routes. The most direct way back to the car park is to turn left here, but we prefer to turn right, which is a gentler graded route and provides better opportunity for flower spotting. After ten minutes or so, this path joins the Tour de Petites Roches, way-marked red and yellow. It crosses two junctions, and in both cases we continue straight on, always descending. Twenty minutes after leaving l'Alpette, it joins a forest track. Turn left here, and the car park is a pleasant 35 minutes amble away, reached about 1½ hours after leaving the ridge.